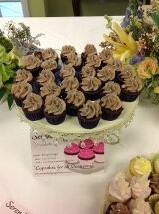 On Saturday I had a cupcake set up at the LA Arboretum for a Hawaiian themed wedding in Peacock colors. It was fun as a real peacock was keeping an eye on me and the cupcakes. 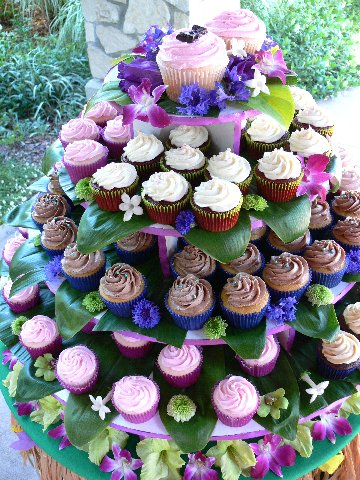 I attached a photo of the cupcake tree and also the toppers I used. I made a groom topper which consisted of a chocolate bow tie and 3 perils used for buttons. The brides topper was a piece of veil with perils adorning the head piece. It was fun to work with the florist who was out of Sierra Madre. Prior to the wedding I attended the 50th anniversary of a group I belong to the American Business Womens Association. This event was held at the Castaway Restaurant in Burbank, CA. This restaurant is special to me as this is where Jay took me right after he proposed, so I love going there and the views are out of this world. 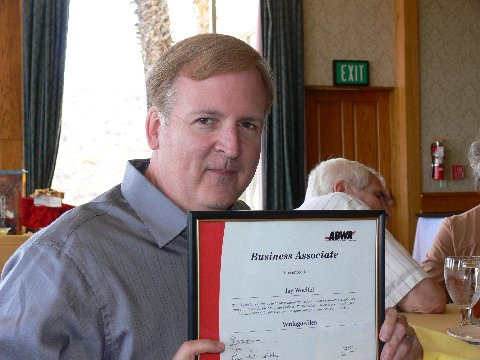 I nominated my husband Jay for the Business Associate of the year, but he didn’t win, but loved that I nominated him. I am working on testing a Spanish style cupcake, so the first one I am going to attempt is a Sangria Cupcake and then I will move on to an Almond Cupcake. Stay tuned for my success on that. Its been hectic the last few weeks with cupcake events. The last blog I was having issues getting photos to attach, but I was able to attach some today. I have attached one photo of my interview on Every Way Woman. I am still waiting to find out when the show will broadcast and I will let everyone know once I do. Last Thursday I provided cupcakes for the Asian Film Festival which is being held at the Directors Guild. I was rather overwhelmed at the crowd of people and everyone seemed to enjoy sampling cupcakes. It was great fun to see the dad from The Wonder Years, Dan Lauria as I used to watch that show. Mr Cupcake also picked out Bill Murrays brother. I have also been busy working on Mothers Day Cupcakes, Confirmation Celebration Cupcakes and hopefully, Graduation Day Cupcakes! I recently created a new cupcakes using Casa Dumetz Wine and hope Sonja the owner will be able to taste them one day soon. I also provided cupcakes for the LA Latina Bloggers Conference that was held in downtown LA and met some very nice people. They were lining up to eat cupcakes! As soon as Mothers Day passes I will be taking a weeks break from cupcakes before Memorial Day and those graduation orders start pouring in. Well, I made it through my birthday! So far, no jury duty yet this week. 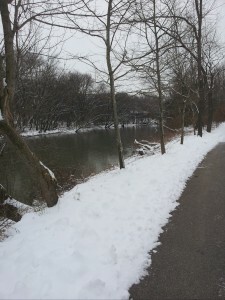 I had a pleasant surprise since my last blog. 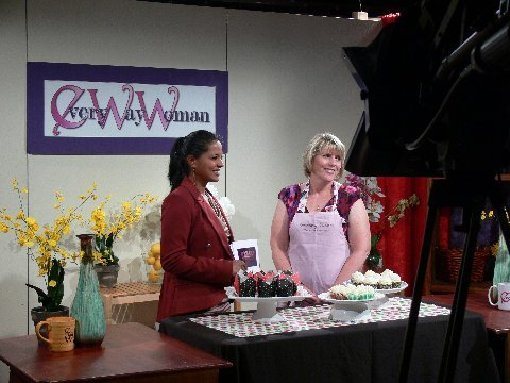 I was contacted by a local Pasadena show called Every Way Woman to be a guest on their show that is now going national! This past Sunday I went to their studios and was interviewed. It was so exciting yet I was so nervous at the same time. I spoke about how Mr Cupcake aka/ Jay my husband is such a tremendous support behind my business and almost started crying. I have talked about his support numerous times, but it hit me as I spoke about it on camera, yikes…..They will let me know when it will air, which should be sometime this summer and will post as soon as I know. I had an exciting order to do for someone who’s birthday fell on the same day as mine! She was having a Jimmy Buffet themed party. I wanted to find a parrot chocolate mold, but wasn’t able to find anything cute. Then online I found the cutest parrot, however it was in Hong Kong. I took the chance and bought it hoping it would arrive in time for me to make 60 parrots with chocolate and it did! The mold was just 1 single parrot, so I spent the week before making parrots each day, but they turned out so cute! I actually made the chocolate in the color of a green parrot. I also participated in the American Cancer Society Relay for Life of Arcadia Cancer survivors and their caregivers day at the Santa Anita Racetrack this past Sunday. It was a great day to be at the races and hopefully, they enjoyed my sponsorship of cupcakes. On to the Latina Lifestyle Bloggers Conference this Friday! I have also been asked to participate in the Los Angeles Asian American Film Festival the first week in May, so that should be fun since we are also involved in the film world! 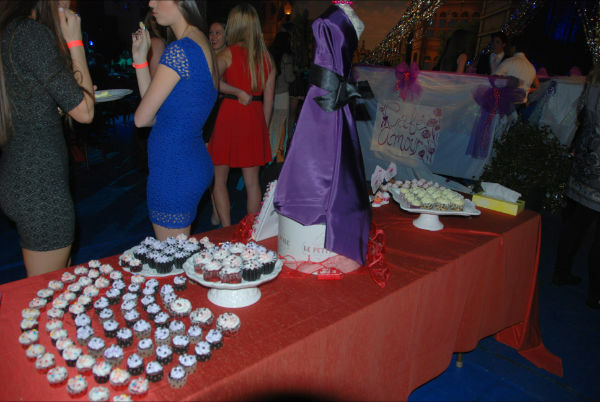 The Santa Anita Uncorked was such a fun event I recently had a cupcake table at. A majority of the money collected at the door for wine and food taste testing went to local charities. The tables were set up right next to the racetrack, so we had the best seat in the house to view the racing and meet a lot of people attending. I can’t wait to do this event again next year. April is going to be a busy month starting with the Williams-Sonoma Artisans’ Market located in Pasadena the first Saturday of the month. This event will be scaled down this month due to construction in the courtyard, so several vendors will be inside the store with their tasty treats! I will be trying out 2 new cupcakes also, one is a Nutella Cupcake and the other new cupcake is a Cherry Almond Cupcake. Wish me luck. Later in the month I will be providing cupcakes for the Latina Lifestyle Bloggers Conference, which will be very exciting. Stay tuned for more exciting cupcake news. The kitchen that I bake at Chefs Center in Pasadena held a mixer and several people participated by giving out samples of their products that they produce. I attached a photo of part of my cupcake display for the evening. Many people went through and it was an interesting evening. Lately, there have been many baby showers. 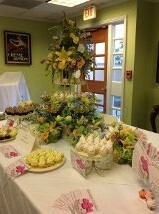 I attached a photo of a set up I did for a baby shower. It was fun finding baby items for the set up and the grandmother seemed quite happy with the set up, yes! I have come up finally with a gluten free cupcake that I am happy with. I tried it out on my BNR Group that I met with this morning. I made a vanilla cake and incorporated apricot preserves into the batter and topped off with a White Chocolate Cream Cheese Icing, yummmmmm, I do have to say it was quite good and everyone in the meeting had one or two and said they were excellant! So, I will be adding that to my menu. Last week, I participated in the opening of the Original Scent custom fragrance bar in Pasadena. I attached a picture of myself and Marley, the owner of Party Goddess Event Planning. It was such a fun event and I met so many nice people, but when I asked Jeff Goldblum if he would like to try one of my cupcakes, he said “no, not on my diet”, so that was a bummer. But, that is ok,many people liked them. I met Sonja of Casa Dumetz Wines and I got a bottle of wine to try in a cupcake recipe, so I am excited to try that out! That is it for today! Off to cupcake! I do not not know where time goes. 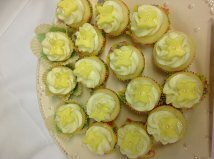 I presented a gluten free lemon cupcake to my friends at a meeting we attended who can not eat gluten. 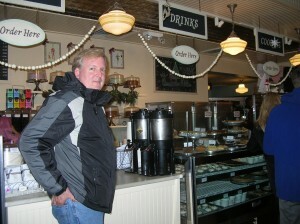 I was not real happy about it, as I am used to a light and moist cupcake, however my gluten friends seemed to enjoy it! I have another meeting next Tuesday and I have another flavor I am going to try to see how that one goes. I will keep trying until I perfect it. On Saturday, I am doing another Artisans’ Market at Williams-Sonoma located at 142 S Lake in Pasadena from noon-4:00pm. The last market was held in February and was a success for the first one. I plan on making Peach Bellini Champagne, Chocolate Chocolate Chip Mint decorated for St Patty’s Day and I am still contemplating the 3rd flavor. Also, on Saturday I am donating some cupcakes to Molly Taylor who is going to particpate in the AIDS/Life Cycle Ride. A Bake ‘n Buy Bakesale will be held at Jones Coffee located at 693 S Raymond in Pasadena from 11:00am-4:00pm. It will be a great bake sale for a great cause. I plan to tailor the cupcakes, so they coordinate with the AIDS theme i.e. red ribbon chocolate pieces etc……. So, stop by the bake sale and then head over to Williams-Sonoma! On Monday, Chef’s Center where I do my baking is holding a Spring Friends Mixer, so people from all areas of business have been invited to see several artisans displays. So a very busy baking weekend. I also have been on a search for the “Pink House” in Lake Como, Italy where Mr Cupcake aka Jay’s great-great grandfather originally saw a house that he liked while honeymooning in Como and came back to New York and had one built. The Lake Como newspaper actually ran a story saying we were looking for the house. This all came about when I was doing water aerobics one morning at the YMCA and one lady Anna mentioned her sister lives in Lake Como, so that got my wheels spinning and I asked her if she would send her a picture of the Pink House in New York to see if she knew of a similiar house in Como. After she contacted the “archives” a story ran in the paper saying we were looking for it. Someone did contact Anna’s sister to say they know the house, but we seem to be having problems getting an actual street address for it. Jay & I want to go to Italy and see the house, but with no address, it makes it a little hard. So, now I am doing some research to locate this house we so desparately want to find. On Saturday was the 2nd Annual American Business Women’s Association Expo. It was a great time. We had a powerful speaker and also during our lunch we had knowledgeable ladies at our tables speaking on business matters. This is a great organization to be involved with if you have your own business and want to meet other lady business owners. You really do not even need to own your own business to be involved in this organization. 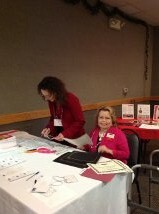 The ladies in the picture are Elysa Rosenfeld-Ortiz and Lori Hartwell who were getting the guests checked in Saturday. On my agenda this week is to test out a gluten free cupcake recipe. I have had way too many requests for gluten free, so I want to see what I can come up with a cupcake that looks and taste good. Next week I can let you know how it went. Again the weeks are flying by and its been crazy busy! The prom was held on a Sunday and the day before I took the unfrosted cupcakes and bowls of frosting and sprinkles to Notre Dame High School in Sherman Oaks. I started off with three girls helping out and before all was said and done, I had at least six girls helping out frosting and adding sprinkles and perils to the cupcakes. They had a great time doing this and it was so much fun for me. 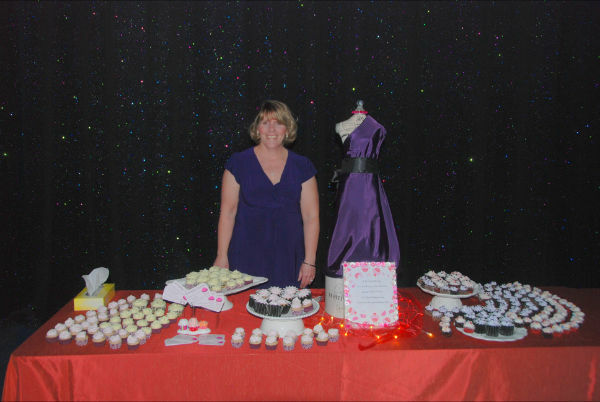 I am attaching pictures of the final display of cupcakes and the prom dress mannequin. I recently had the opportunity to work with a florist in Burbank on a corporate event. The florist and I coordinated the set up and made sure the cupcakes and flowers matched perfectly. I was requested to do make cupcakes that looked “compassionate” and so I did. I had pastel yellow butterflies, white chocolate doves which I made and silver stars with blue glitter to resemble the skies at dusk. I am attaching pictures of this event as it turned out wonderful! 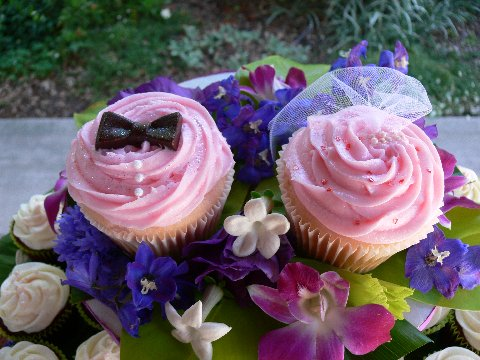 Off to plan the next cupcake event, which I will talk about next week. I am very excited as the 14th Annual Renal Teen prom is almost here. 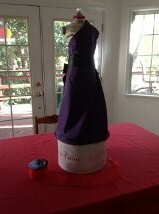 I attached a photo of the prom dress that I made that will be the focal point for the cupcake display. I was out and about walking through a department store and found a hat box that reminded me of Paris, so I bought it for the mannequin to stand on. I have various white plates of different heights that the cupcakes will sit on. After getting this all together, I realized I did not have anything to wear, so today I shopped for my dress. I think my mannequin’s dress is prettier then mine, ha! If anyone would like to rent my mannequin for a party, let me know and I will dress appropriately and set up the display. This week has been very exciting for Serendipity Cupcakes. I met with Mr Pasadena, who told me about a bake sale that is going to help someone raise money for an AIDS Bike ride throughout California, so more to come on that. I also found out that Williams & Sonoma on Lake in Pasadena is going to be holding their first Farmers Market on Saturday, February 2nd and Serendipity will be there selling some yummy cupcakes. Also, as a thank-you to Mike Gatto for getting the Cottage Food Bill passed in California, I will be taking his staff and him some delicious cupcakes at the end of the month. This week was a very positive week. Stay tuned for next week when I will post some pictures of the prom kids decorating cupcakes and then photos from the prom, have I said I am excited! Have a great weekend! Happy New Year 2013!! The last 2 months were a whirlwind and am very glad to be back in sunny California. In my last post I talked about visiting New York City for a film festival that featured Jay’s movie Season of Darkness. It showed in two different theaters and the late night showing was better attended the the afternoon showing, which was a bit unorganized. We had a fun time in NYC. We accidently ran into Magnolia Bakery, so if course we went in and tried a cupcake. I attached a picture of the inside, which was cute. We also had to see what Serendipity 3 Cafe was all about. 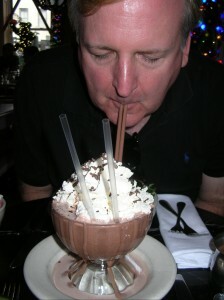 That is Jay drinking their famous Frozen Hot Chocolate, it was tasty. 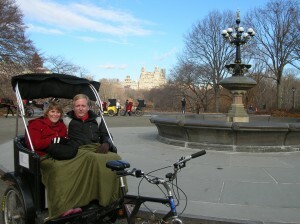 We ended up taking a nice ride around Central Park on the rickshaw which is also pictured. We were back a week and headed to Ohio for the holidays. It was very gray, white and cold. Other then the cold, we had a good time and saw lots of friends and family. I started a Ladies Coffee group several years ago when I was living there and the tradition has continued, so we had an impromptu Ladies Coffee while I was there. Starting to dive into new cupcake projects for 2013. One very exciting event coming up is my friend Lori Hartwells 14 Annual Renal Prom. This prom is held for young adults who have kidney issues. Its a great event that Lori and her helpers put on. The day before the prom, I am going to take unfrosted cupcakes, frosting and sprinkles to the high school and let the kids decorate them. I have an exciting set up in the works, which I will do the day of the prom. I never attended my schools prom, so I am excited to attend this one, kind of like a dream come true. I had planned to try a beer cupcake that I plan to promote for the Super Bowl, but I ended up making “buckeyes” per a friends request who didn’t know what a buckeye is. Essentially, its peanut butter dipped into chocolate. This is a family favorite for Christmas. I took some to a networking meeting this morning and got rave reviews, one person said “I have never tried anything like this”. Its really an Ohio “thing” and people in California have never heard of this special treat. On to a great 2013 for my cupcakes and stay tuned for more cupcake posts and pictures!